I had my last organic chemistry exam before the big final in a couple of weeks. I spent several days studying and feel so relieved that it is finally over. My big reward for all of my effort? A pot of steaming soup and a trip to Trader Joes with my (fabulous and awesome) roommate to stock up on some seasonal goodies. Yeah, I'm not that hard to please. It was very cold and drizzly here today and I had been thinking about making a pot of soup since I first stepped outside in the morning. 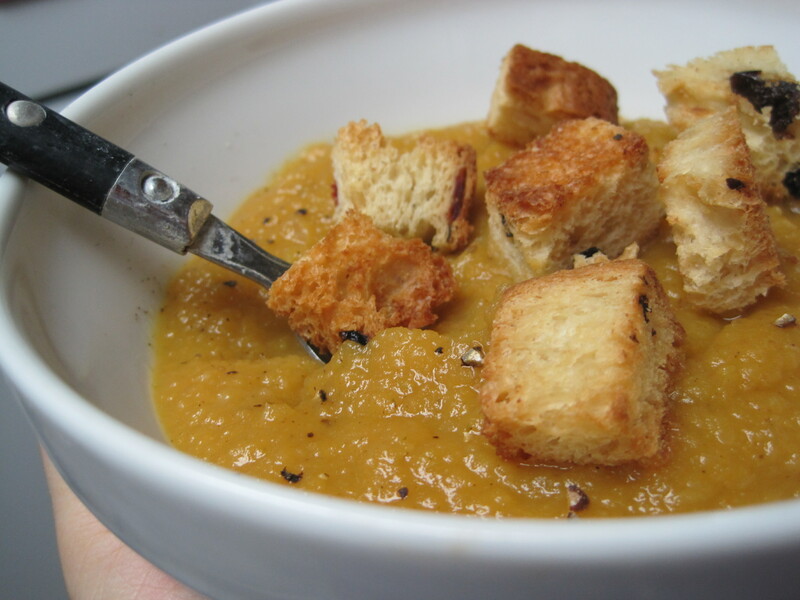 I very much enjoy pureed soups (like this awesome carrot-ginger soup or this butternut squash soup) because I love working with hearty vegetables and squashes (or would it be just squash? squashi? squashies? Nevermind, it's been a loooong day). The soup is thick and hearty (but can be adjusted according to your preferences). It's so perfect to warm me up after all of this chilly weather. Did I mention my roommate was fabulous and awesome? 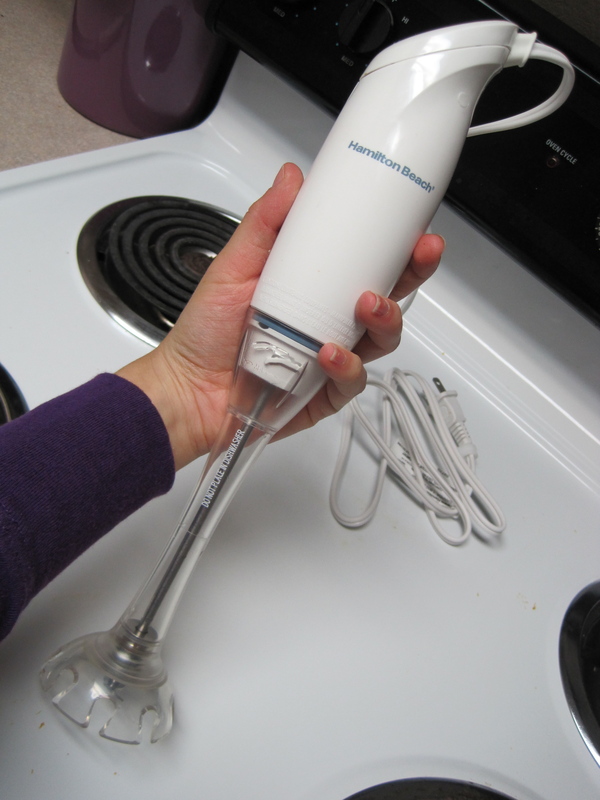 You may remember my little hint about wanting an immersion blender because I was tired of pureeing soups in a Magic Bullet. It's not that Magic Bullets are not wonderful for smoothies and shakes... But I doubt their target audience are college girls looking to puree soups on a weekly basis. Anyway, she read my mind (or my blog) and got us one for the apartment! It made my day, my week. It made my month, except that may not be saying that much since it's only the first of December. I love adding sweet things to dishes that may not normally be sweet. Apples are no exception. I love adding them to one of my favorite Moroccan chicken dishes, some of my favorite Indian dishes, and many soups. 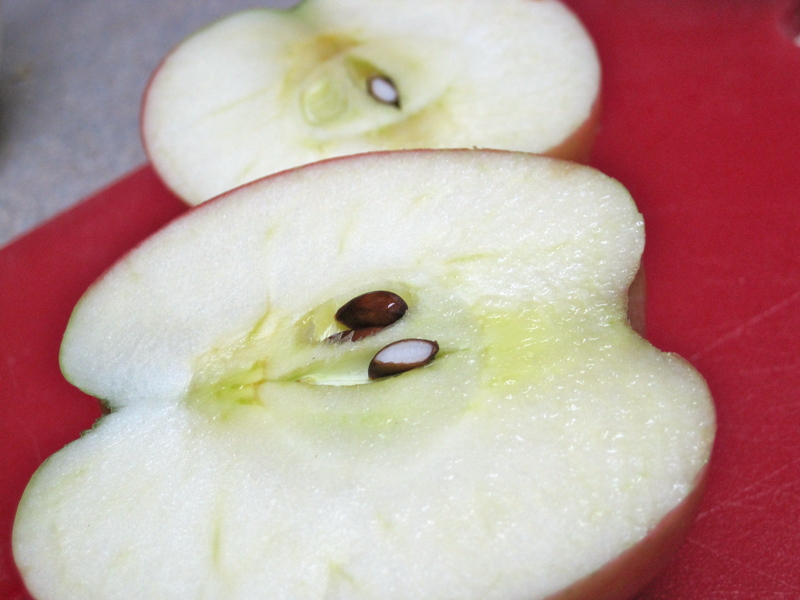 Depending on the flavor of apple, you can create a lot of awesome flavors. Or you can just make some awesome desserts. For this soup, I used a granny smith apple and a pink lady. I love the sweet flavor and the extra texture they bring to the soup. I basically added lots of hearty veggies that I found in the kitchen. I thick carrots, parsnip, turnip, and rutabaga would also be good additions as well. A few weeks ago, I purchased a loaf of panettone from Trader Joes. The type that I bought was more bread-like than fruit cakey. I decided to cut up a few pieces and toast them to create croutons for the top. 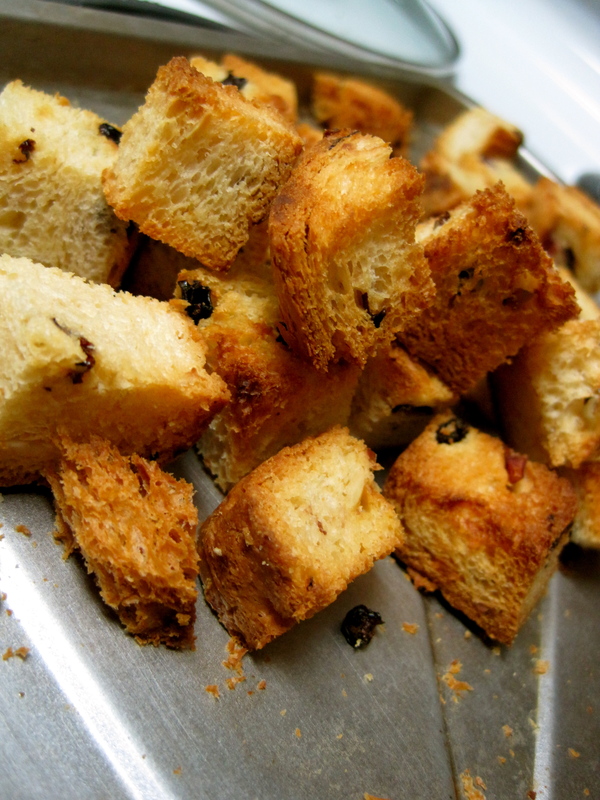 I think any type of hearty bread would work well for homemade croutons. I like using breads that have a little sweetness, like a cranberry-walnut loaf or challah, because they compliment the soup well. This really does have a yum factor of 10,000. Heat oil in a large soup pot over medium-high heat. Add onions and cook, stirring occasionally, for about 3 minutes. 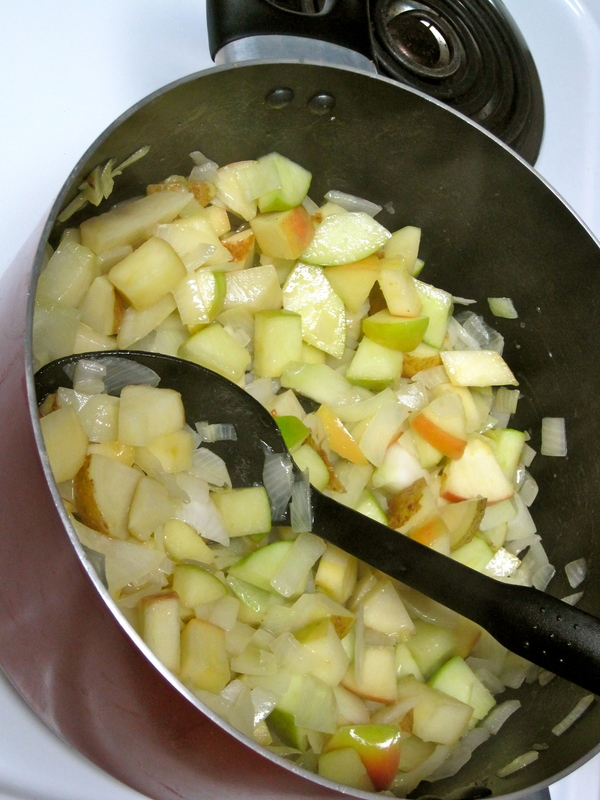 Add apples, pear, and potatoes. Continue cooking, stirring occasionally, for about 5-7 minutes. Stir in brown sugar and cinnamon. Continue cooking, and stirring, for another minute or so. Add 1-1/2 cups broth and pumpkin puree and bring soup to a boil, stirring occasionally. Reduce heat to low and let soup simmer, covered, for 20-30 minutes or until the veggies are soft. Once veggies have softened, remove soup from heat and allow to cool slightly. Puree soup to desired consistency with your fancy new immersion blender from your amazing roommate, or your stand blender, or your Magic Bullet. Add broth as needed if your soup appears to be too thick. I didn't use all three cups of broth, but I like thicker soups. 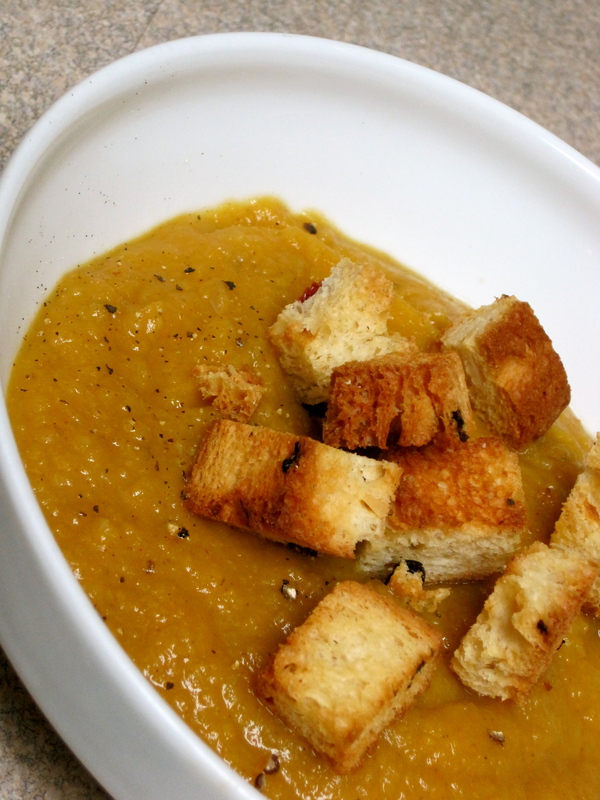 Serve hot with toasted croutons or bread. Refrigerate leftovers for up to one week; Freeze for up to 3 months.